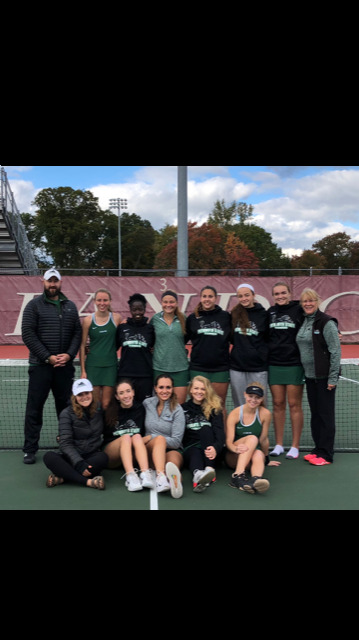 The women’s tennis team traveled to Rhode Island College on October 20thto compete for the championship in the Little East Conference. The tennis team has had an astounding season, one of their best in over five years of the program. Before heading into the playoffs, they ended their regular season on a nine-game win streak. “This team worked together all season long - on and off the court. They were supportive of each other, worked hard to improve their games, and managed to have fun at the same time” coach Barbara Rawlsky-Willet had to comment on her team’s performance this season. The Panthers sadly came up short against RIC and will not advance to the NCAA division three championship in the spring of 2019. They end with a record of 12-3 overall and this would also mark the end of the road for seniors Irene Kigugu (Concord NH) and Megan Wheeler (Manchester NH). RIC grabbed the first two doubles matches to put themselves above the Panthers by two. They almost kept that momentum going, but the pair of Jenna Sundquist (Monument Beach MA) and Kerstin Venincasa (Sutton MA) put a stop to them. A hard-fought match came out in their favor as they defeated their opponents 9-7. RIC followed by winning the next two singles matches against our seniors, Kigugu and Wheeler. Wheeler was the only one to gain a maximum of two points, which was earned in her second set, ending 6-2 in favor of RIC. Venincasa’s sealed Rhode Island’s fate, as her opponent topped her in a close 6-3 and 6-4 win. “The team played a great championship match. They had a long match the day before but came out and played their hardest. There were three matches left on the court when the match was called, and we were within points of winning two of them. The match was closer than the score indicated” coach Rawlsky-Willet said about how she felt about the matches. RIC is now 17-0 for their season and is clearly a big competitor in LEC. The Panthers, in the regular season, lost to them by 7-2.